A Norman castle and ancient cathedral high above the River Medway, winding lanes of old houses, bookshops and medieval walls. The Medway Valley houses Gillingham, Chatham, Rochester, Rainham and Strood (collectively known as Medway). These towns have really easy access to London via the M2 and high speed trains. The pretty Dickensian town of Rochester is steeped in history and has been described as ‘ravishingly pretty’. Gillingham is a lively town with excellent transport links and is the retail heart of the district. 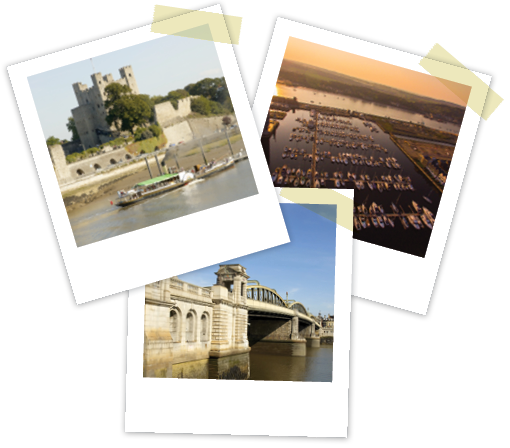 At the heart of Medway is Chatham – a diverse maritime destination with a rich history stretching back more than 400 years. ‘Call The Midwife’ fan? Many of the scenes are filmed at the historic dockyard, which now has a visitors centre dedicated to the TV series!